Looking through the Jackson Township Planning Board Minutes, I came across a representative for Six Flags requesting an ordinance for the park to construct a 100-acre Solar Farm on property to almost fully power the park. (And fully power it at times -- I assume in the off-season?) The location is in a wooded area, supposedly near Reed Road. Nice find Matt! It is interesting that they would use 100 wooded acres and not make use of the already cleared unused portion of the North American Safari section and the neighboring baboon area. They must have some future plans for that space unless it's just simply because that area isn't large enough. Unused Safari areas were also my first thought and I too thought they must have plans to use it, or maybe don't have plans, but don't want to loose the potential for the future. Smart Idea. They get Electricity (CASH), They can sell it to the city for a Premium (CASH), and they get a Tax Deduction (CASH). 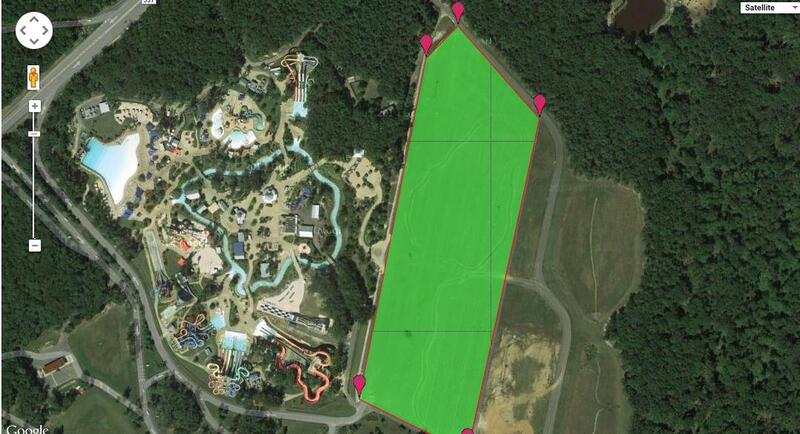 Plus doesn't the Great Adventure Resort have like 600 acres undeveloped? if I were great adventure, I would keep the solar farm out of guests view, I think that's why its not going near kinda ka and wild safari. As they stated in the article, 100 acres of wooded area would be A LOT of trees that they would cut down. Just want to point that out since I'm sure a lot of animals homes would be destroyed and so on. For size comparison the area of the parking lot is about 56.408 Acres according to an area calculator site i found. So Basically double of the parking lot if it is correct calculations. I don't think the region has enough sunny days to make it worth while. We have a lot of overcast and stormy days where there would be little output. Also panels need to be cleaned often, just a little dirt can greatly reduce their effectiveness. That will be giant! I hope they do it our of sight of the guests. I Don't remember where but a part of Europe uses solar panels and they have less sunny days than Seattle. Later Tonight or Tomorrow, I'll find out the location. We have plenty of sunny days. More and more houses are putting solar panels on their roofes and have ya not seen all the solar farms popping up??? There are 3 of them alone in a 5 mile radius of me. Looking online, NJ gets an average of 94 sunny days a year. 111 partly sunny days, with a total of 205 days with sun (2,499 hours of sun). That leaves 160 days without sun annually. Overall, NJ and the northeast is not that sunny and why rickets are more common for northeasterners. The solar pannels and farms are probably more for tax credits and carbon credits than saving power. To compare, CA and NM have 340 sunny days a year. It does not get anyone off oil, or coal or gas. Some studies say that it actually increases the burning of these fuels because generators must be on spinning reserve to take up the slack when the sun does not cooperate. Generally spinning reserve - that is the generator is fired up and synchronized to the grid - takes about 2% of output so for a 1000 MW coal plant you are using 2% x 1000 = 20 MW just to keep the machine running when it would otherwise not be. That basically wipes out all your solar output. They increase the amount of CO2 because the panels are almost all made in China whose primary energy source is coal and making these panels is VERY energy intensive. It snows in NJ solar panels covered in snow produce nothing. Massive power swings occur when clouds roll over and intercept the light. Then there is aintenance of solar panels, the panels' output degrades by about 1% per year of use. I have soloar panels to heat my pool, and while I like them, they do have limits. Even on hot sunny days they lose their heating power for the day by dinner time. Their heating power starts to wan in Aug and really drops in Sept. They also requre a large clearing to to get the max amount of sunlight exposure and to prevent trees from shading the panels at dawn or dusk. Why not just cover the parking lot as part of it? A lot of football stadiums are starting to do that. I for one wouldn't mind it, keeps the car in the shade. Do your really think people will say "OMG eww solor panels"
I would think the cost of maintaing the panel setups in the parking lot would be pretty high compared to a remote location. All those support pillars could also add to traffic flow issues not to mention security concerns. Sadly all those supports would give thieves more cover and promote more break ins. That is the problem with the trees in SFA's, parking lot. Panels would not help during an outage unless they are connected to a large bank of batteries. I mentioned the parking lot based on the fact the Great Adventure prides themselves on saving as many trees as they can while building new rides/projects. So to turn around and possibly clear out 100+ acres of trees is a little odd. ^I am not saying that the pillars will be in the main roadways, but just as it takes longer to exit a parking deck than a parking lot, solar panel pillars could slow the process even if it something as simple as having to back out of a parking space than pulling ahead. Odd how they're going with Solar Panels instead of a Wind Farm. Also, if they were to put solar panels in the parking lot, it would mean they have to repave the entire lot since I'm fairly certain it won't be an easy task once all the solar panels are in there. They don't want to pave the lot because of how much money it would cost. Pillars, even if they are not blocking the roadways would still obstruct vision which would still slow down traffic. I know they aren't thinking of the parking lot but.... Maybe people would exit in rows instead of the mess that occurs at the end of the day during fright fest. 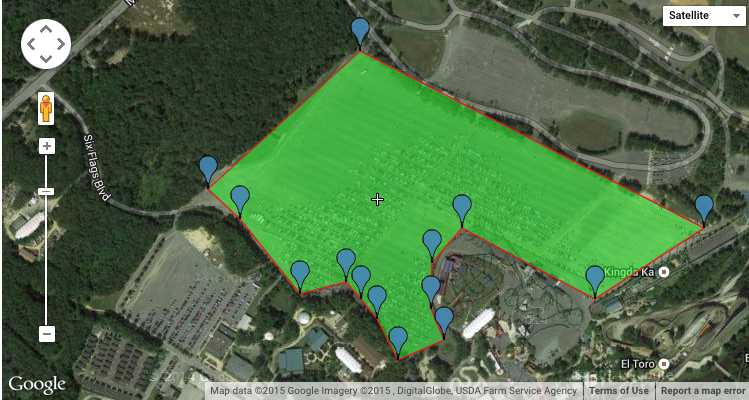 JDC, What does adding Hurricane Harbor's parking lot do to the total area? Hurricane harbor is about (again if this is correct) is about 16.60 acres. Keep in mind too the GA parking lot did not include the road going in/out and the overflow lot. Re: The theft concerns, I feel like panels with pillars could help, if the underside of the panels had better lighting and (clearly marked) security cameras. One more jdc12192... how about the employee parking lot?